Design and construction of website of the European University Center for the Cultural Heritage (CUEBC). 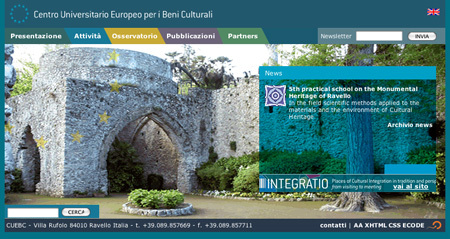 The CUEBC located in the prestigious Villa Rufolo of Ravello on the Amalfi Coast, and is a center of excellence for scientific and professional expertise of graduates in the field of cultural heritage. The site has conducted a total redesign, completely reworking the information architecture is that the navigation structure, in addition to the layout and presentation of content. The objectives of the redesign aimed at renewal of CUEBC online image, and better presentation of content (number and laminated) that would guarantee its ease of use by users. The site was also associated with a desktop publishing system, the ECOD platform, which allows stand-alone update by the editors of CUEBC. The site was developed with the aim of making content fully accessible, respecting compliance with the second level (AA) accessibility.